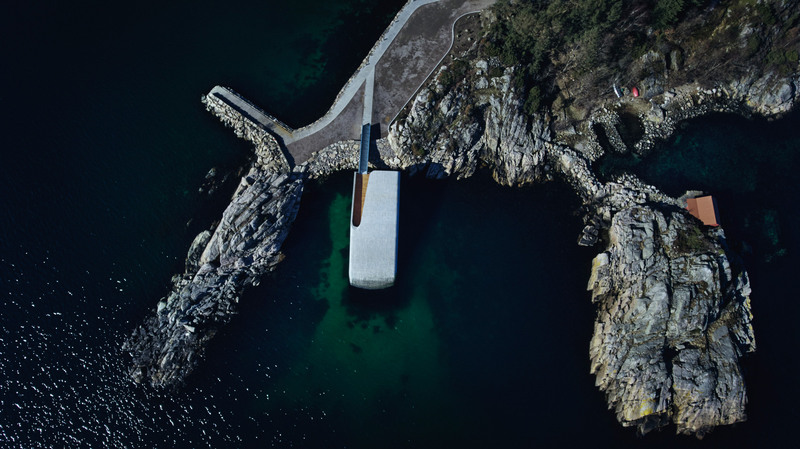 Snøhetta has completed Under, the “world’s largest underwater restaurant“, which plunges from a craggy shoreline in the remote village of Båly, Norway. 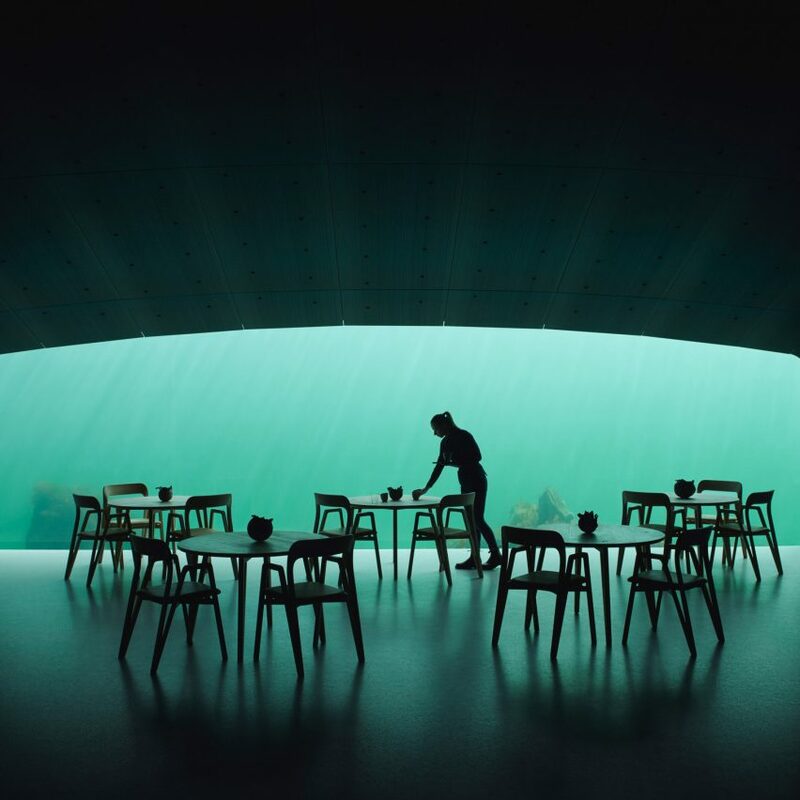 Designed by Snøhetta to resemble a sunken periscope, the 495-square-metre restaurant is fronted by a huge panoramic window that gives visitors a “unique view” of marine life. 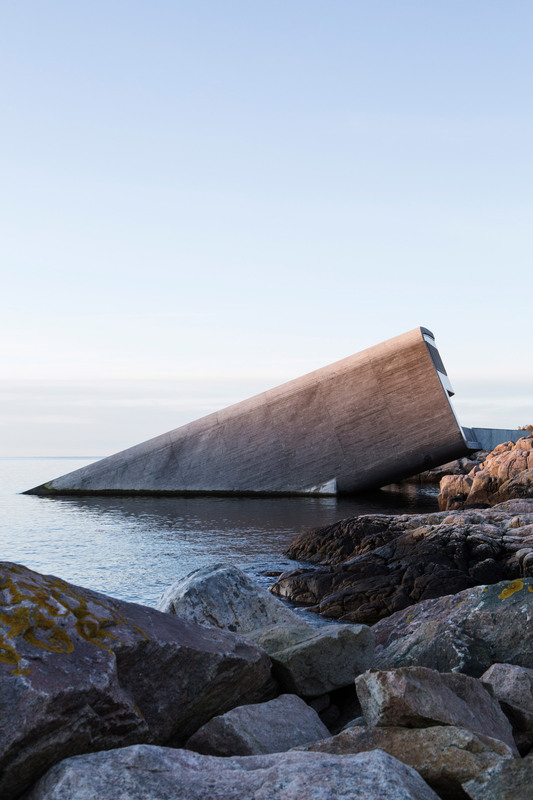 The building on Norway’s southern coast, which can seat up to 40 people and will also be used as a marine research centre, is Europe’s first underwater restaurant. Under was designed to be as simple as possible. It takes the form of a monolithic “concrete tube” that is 34 metres in length. The walls are slightly curved and half-a-metre thick, providing optimal resistance against the forces of waves and water pressure. “The idea was to make a tube that would bring people from above sea level down under the sea,” Grasdal added. The concrete has been left with an exposed, rugged texture to encourage algae and molluscs to cling on. Overtime this will create an artificial mussel reef that helps purify the water, and in turn naturally attract more marine life. Under is accessed by untreated oak-clad entrance. Overtime it will fade into grey tones to complement the raw concrete. The oak continues inside the building, where the interior finishes are intended to contrast with the exterior, creating a warm atmosphere that prevents the feeling of claustrophobia. The restaurant has three levels including an foyer and cloakroom, champagne bar, and main restaurant on the lower floor. They are joined by a giant oak staircase. The focal point of the restaurant is its panoramic acrylic window, which can be seen from each level within the building. It measures 11 by three metres, spanning the length of the restaurant wall. A large vertical window also punctures a wall in the champagne bar, extending down to the restaurant to give visitors a view of the sea level, while getting the daylight through. 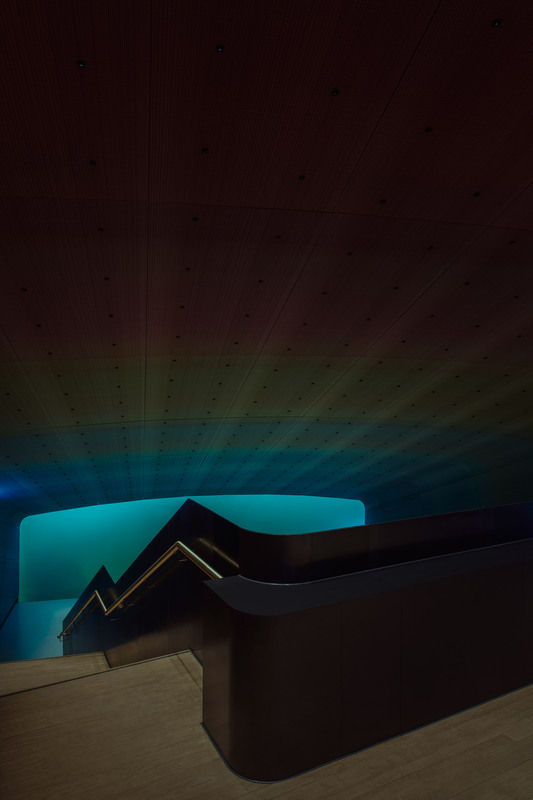 To enable visitors to observe this sea life through the acrylic windows at night, Snøhetta has teamed gentle lighting on the seabed with muted interior lighting. 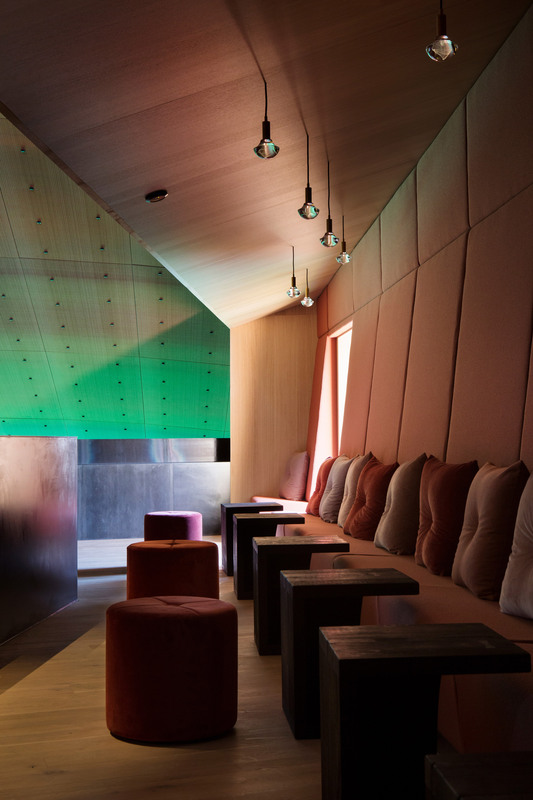 “The idea was to have a gradient, starting with light colours to deeper colours at the seabed,” senior interior architect Heidi Pettersvold Nygaard explained. 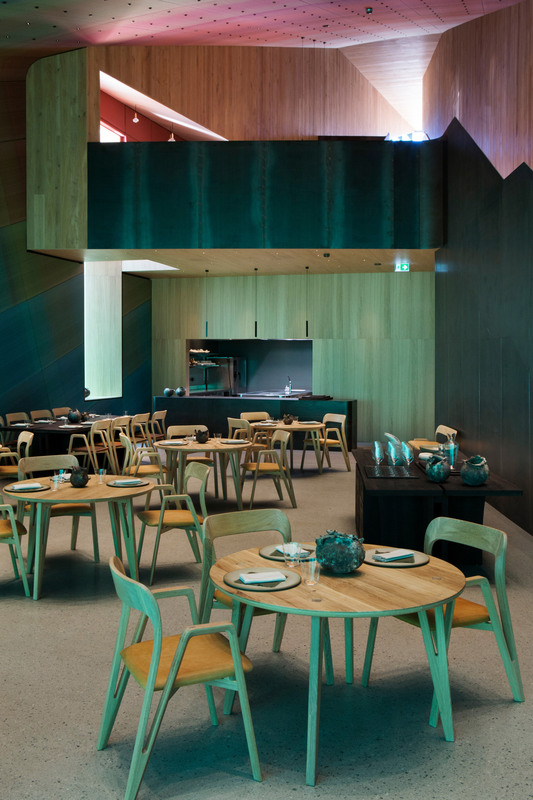 In the main dining room, terrazzo flooring is paired with deep blue and green hued acoustic panels inspired by the seabed, seaweed and rough sea. Meanwhile, the champagne bar above has warmer pink and orange tones to evoke shells and sand higher on the shore. Furniture throughout Under is also bespoke. 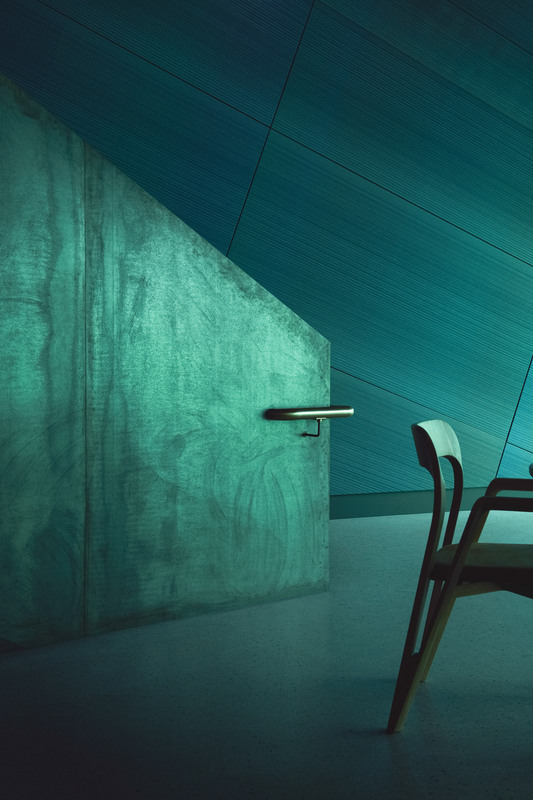 Charred oak tables are teamed with angular chairs and ceramics designed by a local artist using sand from the seabed. “You could easily think going five metres underneath the water can be claustrophobic, but no one feels that here,” said Grasdel. 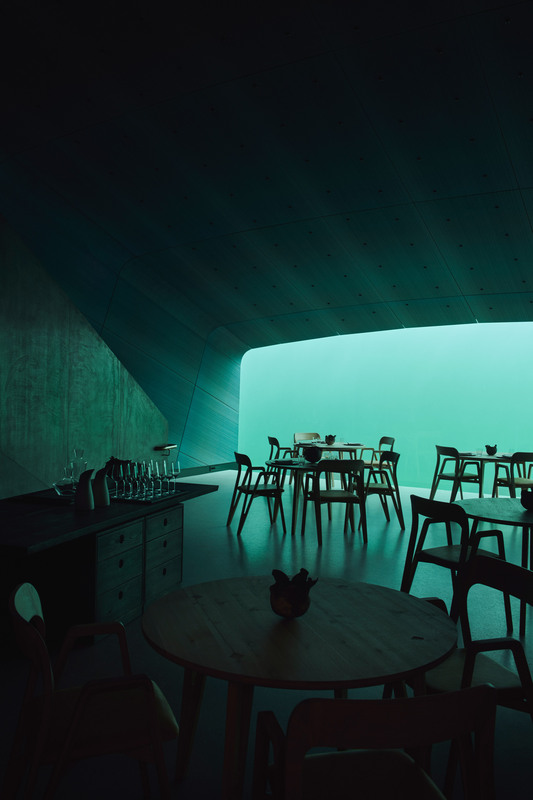 Through its architecture and menu, Under is to also intended to inform the public about the biodiversity of the sea. 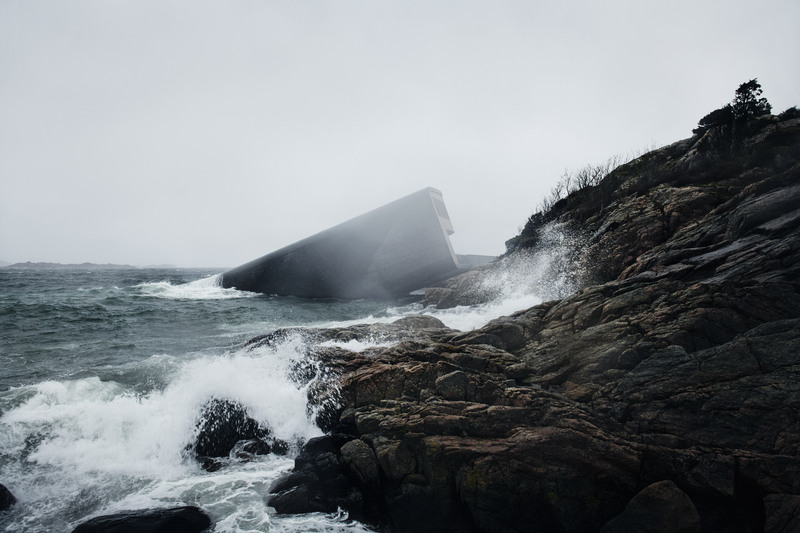 Snøhetta is an architecture and design studio founded in 1989 by architects Craig Dykers and Kjetil Trædal Thorsen. It has offices in Oslo, New York City, San Francisco, California, Innsbruck, Austria, Singapore and Stockholm. 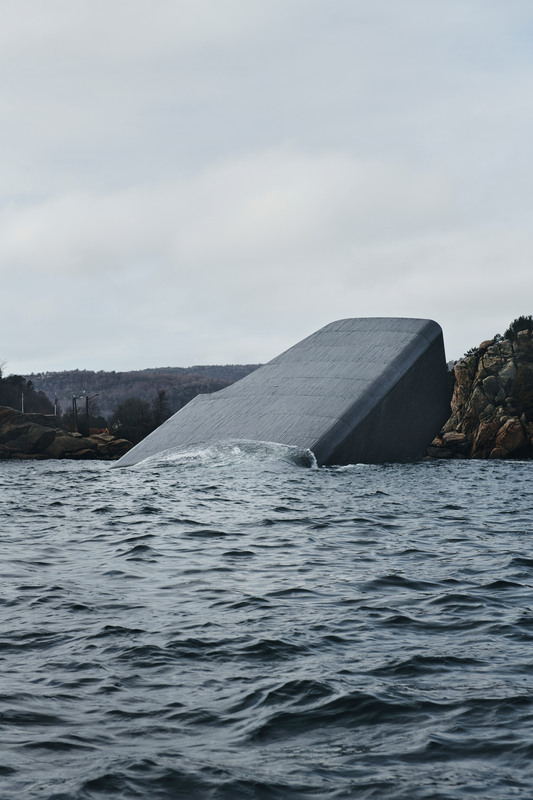 While Under is the studio’s foray into underwater architecture, the firm has designed a number of waterside buildings, including the Oslo Opera House, alongside a hotel for the Lofoten archipelago. Photography is by Ivar Kvaal unless stated. 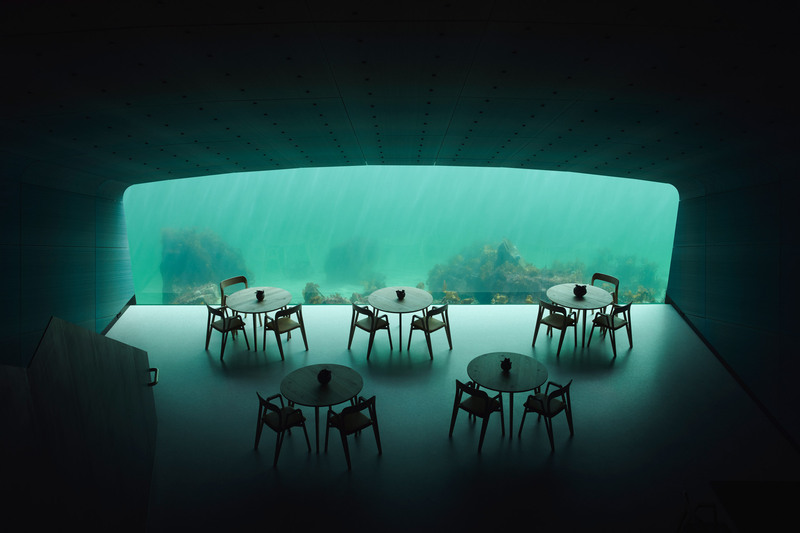 The post Snøhetta completes Europe’s first underwater restaurant in Norway appeared first on Dezeen.